"I converted most of my music collection to WMA back when I used a Windows computer. I recently purchased a Mac, which won't play any of my WMA files. How can I convert WMA to MP3 on Mac OS X?" I've previously covered solutions for how to convert WMA to MP3 on Windows. If you still have your Windows computer, the easiest thing to do might be to convert the files with either the Windows version of iTunes or another software application before transferring the files to your Mac. Apple doesn't include WMA file conversion in the Mac OS X version of iTunes, so if your only option is to convert the files on your Mac, you will need additional software to convert from WMA to MP3 on Mac OS X. Currently the best solution I've found for WMA to MP3 conversion is an app called Switch Audio File Converter. When you get to the download page, you have to scroll to the bottom to choose either Intel or PPC version, depending on your Mac. 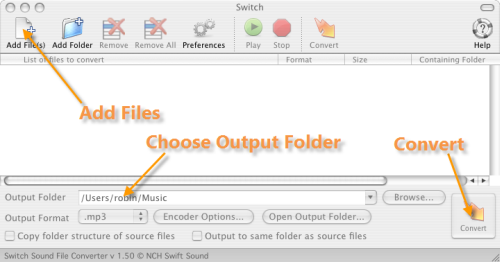 In order to make Switch Audio File Converter work, you also need to download Flip4Mac WMV Player, which is a free QuickTime plugin. Flip4mac is currently Microsoft's officially supported way to add Windows Media file integration on a Mac for both WMA and WMV formatted files. Once you have both components installed on your Mac, all you need to do is add one or more files to the application, choose your output location for the files, and convert.